If you miss Google+ notifications when you’re not visiting a Google page, you can now install a Chrome extension and always get the latest updates. “Whenever you have a new notification (for example, when someone adds you to a circle or shares a post with you), the extension button will turn red and show you how many updates are waiting for you. 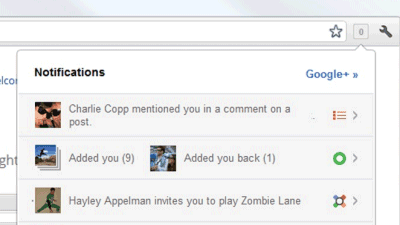 Once you click the button, a window will drop down showing you all of your most recent notifications. You can act on notifications right from the extension, whether you’re replying to a comment or adding someone back to your circles. That way you can stay up-to-speed with your circles on Google+ no matter where you are on the web,” informs Google. There’s also a +1 button for Chrome that lets you +1 a page and share it with your circles. Many of the changes we make are so subtle that very few people notice them. But in the last day or so we launched a pretty big algorithmic improvement to our ranking—a change that noticeably impacts 11.8% of our queries—and we wanted to let people know what’s going on. This update is designed to reduce rankings for low-quality sites—sites which are low-value add for users, copy content from other websites or sites that are just not very useful. At the same time, it will provide better rankings for high-quality sites—sites with original content and information such as research, in-depth reports, thoughtful analysis and so on. We can’t make a major improvement without affecting rankings for many sites. It has to be that some sites will go up and some will go down. Google depends on the high-quality content created by wonderful websites around the world, and we do have a responsibility to encourage a healthy web ecosystem. Therefore, it is important for high-quality sites to be rewarded, and that’s exactly what this change does. It’s worth noting that this update does not rely on the feedback we’ve received from the Personal Blocklist Chrome extension, which we launched last week. However, we did compare the Blocklist data we gathered with the sites identified by our algorithm, and we were very pleased that the preferences our users expressed by using the extension are well represented. If you take the top several dozen or so most-blocked domains from the Chrome extension, then this algorithmic change addresses 84% of them, which is strong independent confirmation of the user benefits. So, we’re very excited about this new ranking improvement because we believe it’s a big step in the right direction of helping people find ever higher quality in our results. We’ve been tackling these issues for more than a year, and working on this specific change for the past few months. And we’re working on many more updates that we believe will substantially improve the quality of the pages in our results. To start with, we’re launching this change in the U.S. only; we plan to roll it out elsewhere over time. We’ll keep you posted as we roll this and other changes out, and as always please keep giving us feedback about the quality of our results because it really helps us to improve Google Search. You can also edit your list of blocked sites by clicking on the extension’s icon in the top right of the Chrome window. This is an early test, but the extension is available in English, French, German, Italian, Portuguese, Russian, Spanish and Turkish. We hope this extension improves your search experience, and thanks in advance for participating in this experiment. If you’re a tech-savvy Chrome user, please download and try the Personal Blocklist extension today. extension to check for updates. answers await you in the source code!